A&R Aviation offers complete aircraft maintenance services from maintenance bases in WA and QLD. We also offer comprehensive remote/on-site services around the world to service our clients, helping minimise aircraft downtimes and reduce costs. 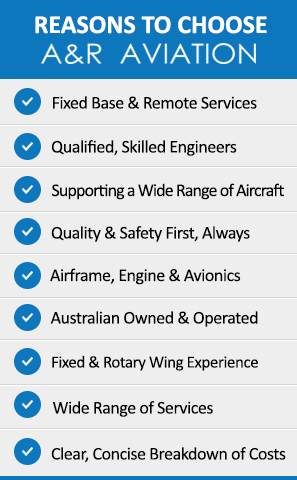 A&R Aviation is an Australian owned and operated business specialising in providing maintenance, repair and overhaul services along with sales and support to private and commercial clients & operators throughout Australia and Globally. A&R Aviation supports a wide range of aircraft; from single engine piston aeroplanes and helicopters to twin engine turboprop aeroplanes and twin-turbine medium helicopters. 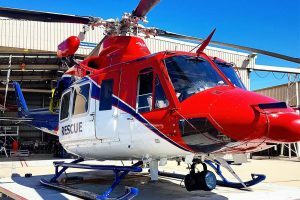 From a Jabiru to an R22 a Metro or Bell 412, we have you covered. We regularly travel all over Australia and overseas for the convenience of our customers, supporting all facets of the industry that we know and love. 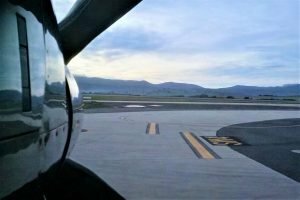 A&R Aviation offer base and line maintenance services from our two maintenance bases, Jandakot Airport, WA and the other at Charters Towers, North QLD. We also offer comprehensive remote/on-site services to our clients, helping minimise aircraft downtimes and reduce costs, getting you back in the air quickly and safely. We are a Western Australian owned and operated Aviation Services Provider with years of experience in the industry. Our position in the marketplace allows us to provide cost efficient aircraft maintenance solutions tailored to suit your needs and requirements, be it temporary locations or fixed base, locally or anywhere in the world. Contact us today to find our more. We go that extra step to ensure our customers receive the best service from our team. Whether you require a regular maintenance agreement, a one off inspection or snag fixed in the bush, we can provide the solutions. From light aeroplanes to medium twin helicopters, we have you sorted, find out more below. At A&R Aviation Australia, we care about not just what we do, but how we do it. We focus on our customers needs and work to continuously improve safety while delivering maintenance that exceeds regulatory standards. Our customers can expect fast and reliable maintenance. We have great relationships with our suppliers which means we can offer quick turnaround times and cost efficiencies. Our commitment to customer service and delivering quality aircraft maintenance at competitive prices is unmatched and we regularly receive repeat work and referrals from our clients. With experience in Australia, Oceania, Africa, The Middle East and Europe, you can rely on us when it matters.